Ask working performers, who has created the most practical and impressive mentalism in recent times and one of the first names you will hear is Barrie Richardson. 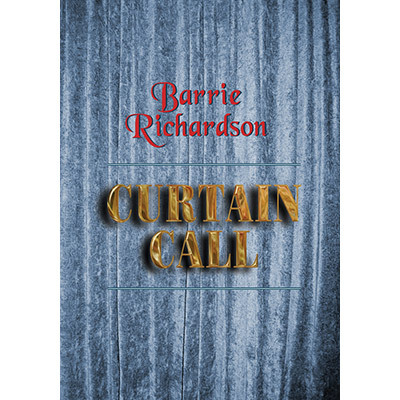 Curtain Call is Mr. Richardson's third major collection of mentalism, and in it he has held nothing back. He opens with the full details for his entire professional act, follows up with dozens of wonderful tricks, routines and tools for the mentalist, and concludes with a unique piece that always brings a strong emotional response and a spontaneous ovation from his audiences. Barrie Richardson has a reputation for devising impenetrable mental mysteries that float upon multiple layers of deception. This is combined with a disconcerting directness that achieves the effect with minimal procedure and maximum power. Whether you are a fan or are encountering Barrie Richardson's work for the first time, if you enjoy theatrical, commercial and cunningly constructed mentalism, Curtain Call will fulfill your desires and expectations. An old key that turns and crawls eerily in the hand. Is it haunted? Is it psychokinesis? The effect meets and exceeds that accomplished by expensive mechanical keys, but uses an ungimmicked key that may be thoroughly examined before and after. An ordinary pencil, lying across the open hand levitates in full light. Then, when someone is asked to lift it off the hand, he finds it impossible! Once the magnetic suggestion is removed, the pencil may be effortlessly taken and examined. The mentalist writes down a target word. Someone then takes an imaginary stroll through a bookshop, chooses any book, any page and any word. When the word is revealed it proves to be the performer's target word! The person is then asked to concentrate on the mentally chosen page number in the imaginary book - and someone from the audience divines it! Incredibly powerful tools for the mentalist are revealed. Among them are some of the most deceptive billet peeks and switches ever published; a new gimmicked envelope that permits the contents to be glimpsed or stolen, yet can be freely handled by spectators; a perfected standing switch of a full deck of cards. All have fooled expert performers as well as the public. In the past, Mr. Richardson has gained a reputation for coming up with some of the best and most practical methods for the elusive Card at Any Number effect. In Curtain Call he reveals what he considers his finest version, done with an ordinary and legitimately shuffled deck. In this book you needn't worry about what is behind the curtain. The reality will be thrilling! 263 pages in deluxe hardcover. Vanishing Inc: When you published Barrie Richardson's first book, Theater of the Mind, it was a sensation. We credit that book with helping the renaissance of mentalism in our field. Mr. Richardson has since enjoyed a huge following. The stakes are higher now for his third and final release. Tell us what excites you about Curtain Call. Stephen Minch: What excites me is the obvious fact that Barrie has continued to create new material as strong as that in Theater of the Mind, and stronger. As I selected pieces from the body of work Barrie sent me, I became convinced that the content of Curtain Call was as solid as his first book. The material features the same astute combination of engaging presentations, fresh approaches and adroitly structured methods. Vanishing Inc: Does he explore any areas that he had not explored before? Can you point us toward your favorite item in this collection? Stephen Minch: Barrie has always shown a tendency to return to certain plots and topics, to refine some of his previous ideas and find new paths from them. This practice is certainly on display in Curtain Call. However, mixed with these are quite a few entirely fresh ideas. Among these are two that particularly excite me. "The Propensity To Be Influenced" is one. This takes a wonderful idea of Annemann's and pushes it in a remarkable direction. The second is Barrie's Osmosis Envelope, a gimmicked envelope that is freely handled by a spectator, yet it instantly allows the information sealed inside to be glimpsed or stolen. Both these items strike me as having tremendous potential, stretching beyond the applications Barrie provides, which are in themselves excellent.